The Footboard Panel is a wonderful Night and Day Furniture innovation, and practically essential if you are using drawer storage underneath a bed. Beds come complete with 10 pcs of 1x4" mattress support slats and supported down the center with our rail and foot support system. The Bedroom Collection beds comes with a variety of useful and attractive accessories including our patent pending Folding Footboard Bench. 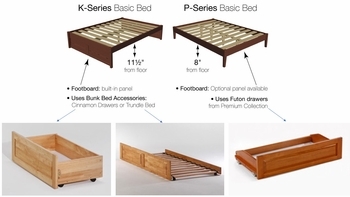 Beds marked as K-Series are a High platform bed and use a K-Series Footboard, with a built in panel. Accessories include Cinnamon Storage Drawers and Trundle Bed. 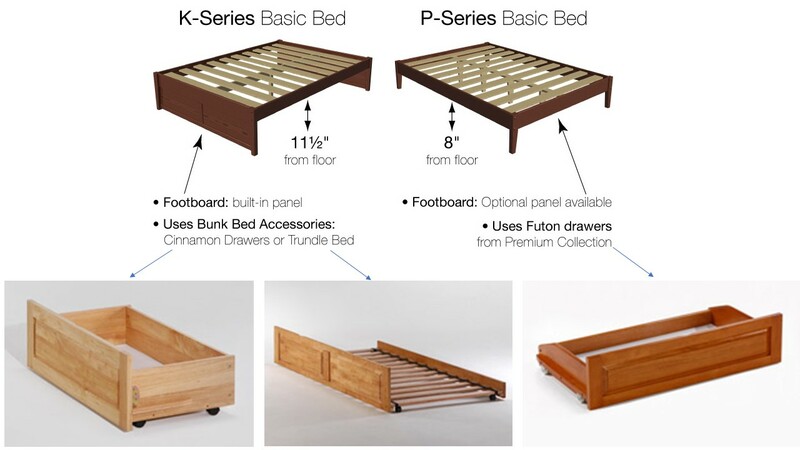 Beds marked as P-Series are a Low platform bed for box spring, and use a P-Series Footboard, with an optional built in panel. Compatible with Futon Storage Drawers. Case Goods and Accessories that brings with it a few delightful tangy twists. From a choice of knobs (wood and metal) packed with every dresser, to our patented Folding Footboard Bench, you can shape and style any bedroom to suit your needs and taste.